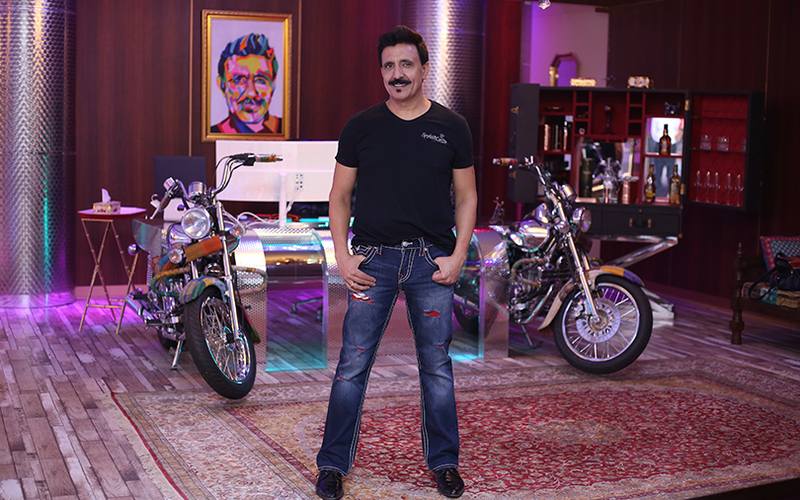 Ebix chief executive officer Robin Raina. It’s safe to say that most of Ebix Inc’s shareholders didn’t bat an eye when the Nasdaq-listed firm announced last week that it had offered to buy travel portal operator Yatra Online Inc for $336 million. Although this would by far be its biggest-ever buyout, Ebix was staying true to form given its eye-catching spree of snapping up nearly 20 India-focussed ventures in just the last two years alone. On paper, four-decade-old Ebix is an enterprise software-as-a-service provider that offers end-to-end solutions including an e-commerce platform for insurance and other financial services companies across 40 countries. But over the past five years, the Atlanta-headquartered firm has diversified to build a big business in the remittance industry with a sharp focus on India, which has the world's largest share of inward remittances annually at around $80 billion. Of late, Ebix has also been trying to expand its corporate travel portfolio business in India and has struck six related acquisitions in a short span. Fellow Nasdaq-listed firm Yatra, which last Friday gave Ebix the go-ahead to start conducting due diligence, is in line to become the seventh. In hindsight, Ebix chairman and chief executive officer Robin Raina, who has led the company since 1999, had dropped an obvious hint in the build-up to the Yatra announcement -- perhaps another reason why its share price remained unmoved. India’s travel markets are growing at the rate of 27-30% annually and it is important that we take a leading position in this market. We are second today in B2B/consumer/retail markets behind NASDAQ-listed Yatra. And we are focussed on being number one by the end of the year. I see this as a 20% growth business organically. We’re also pursuing a number of opportunities that can fast forward our attempt to dominate India’s travel markets. It’s no coincidence that Ebix’s India push has a lot to do with the background of CEO Raina, who was born and raised in Patiala, Punjab. But this personal connection aside, the company feels it has enough reason to be bullish about India and continue with its acquisition spree. After all, it has made a quick impact since entering the country in mid-2017 with the big-ticket acquisition of digital payments firm ItzCash Card Ltd. The revenues of India division EbixCash -- which combines its remittance, travel, wealth management and wallet businesses -- tripled from $66 million in the full fiscal year of 2017 to $219 million in 2018 (this includes some remittance revenue from Philippines and Indonesia). And during the last quarter of 2018, the India unit's share of Ebix's overall revenues crossed 50% for the first time. "We see India as a very large business opportunity and honestly believe that the India operations can be many times larger than our existing operations in the US,” Raina told TechCircle. However, the breakneck speed at which Ebix has been snapping up targets has prompted some detractors to raise question marks. Nearly all of Ebix’s recent acquisitions have been in India even though its core SaaS business has a negligible presence in the country. While a former Ebix employee told TechCircle that he appreciated the risks Raina had taken to create a larger play in technology-based financial services, he also felt that Ebix was perhaps biting off much more than it could chew. "Ebix is trying to consolidate the full market with several acquisitions. You don't need to keep buying everyone. Once you have a dominant position in the market, you can gradually increase market share," said the executive, who requested anonymity. The remittance business is a case in point. 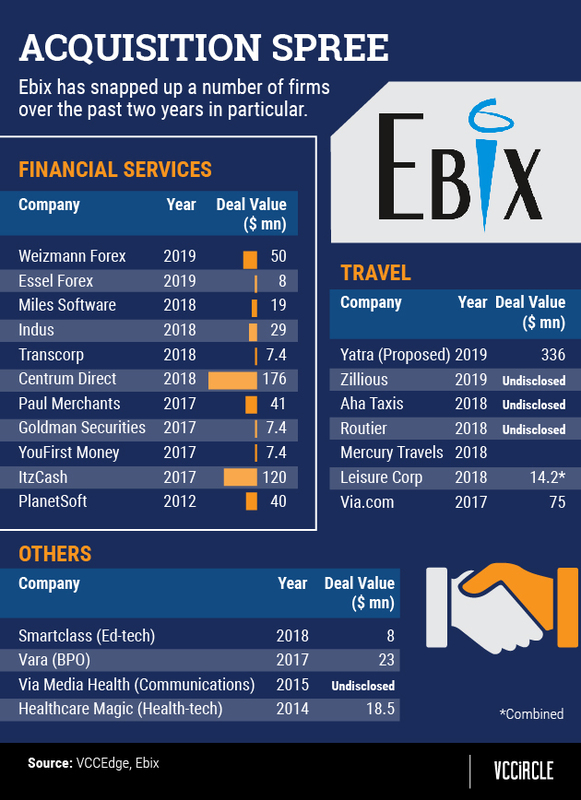 Ebix has acquired a number of companies in this segment including two such buyouts in the first three months of 2019. The standout deal was its acquisition of Centrum's forex business for $175 million in April last year. "You cannot acquire 18 companies in two years and expect all these to deliver the real potential of these acquisitions, some of which were loss-making. Also, the Indian market is dynamic," the executive added. For his part, Raina acknowledged that Ebix’s focus on India was partly driven by his love for the country. But he believes the strategy has been reaping rich dividends. "We have delivered 80 quarters of sequential growth without the operating margins going down. Everything that we acquired made profits within the first three to six months. These were companies that were being run in losses by their founders for 10-15 years," Raina said. The financials for some of the acquired companies appear to support his assertions. For instance, ItzCash posted higher net sales and swung to a net profit in the financial year 2017-18 after recording losses in most of the previous financial years. Raina claimed that the gross merchandise value -- the total value of all services sold -- for remittances had crossed $6.5 billion and it was the largest player in the industry in India. The CEO said that he has consistently targeted operating margins of 30% for new companies entering the Ebix fold and has shut down divisions which could not meet their targets. Raina also said that with the well-established US business on “autopilot”, he has been devoting most of his time and energy to the India business. "We want EbixCash to be a big fintech multinational out of India and a planned initial public offering (whose value he pegged at $3 billion ) later this year or early next year for the entity will strengthen its chance of doing so," Raina said. Devendra Agrawal, founder of investment banking firm Dexter Capital, said that Ebix has perfected the art of acquisitions since most of the deal sizes are small and do not imperil its overall cash stability. Further, Ebix's Indian acquisition spree has been largely funded by the cash-rich and debt-free US entity. "While M&A could be a risky strategy, Ebix has consistently delivered growth, dividends and share buybacks," Agrawal added. Ebix recorded revenue of $136 million during the fourth quarter of 2018, up more than 30% as compared to the $105 million it posted during the same quarter of 2017. On March 1, Raina declared a full-year revenue of almost $500 million for 2018. He further raised its annualised quarterly revenue projection from $650 million to $750 million by the last quarter of 2019. For Ebix to meet that target, adding Yatra to its EbixCash operations will be key. Yatra has annual revenues of around $150 million, of which the extremely competitive hotel segment contributes just about 15% while accounting for most of the firm's losses. While its IPO in 2016 gave Yatra a temporary liquidity cushion, deep-discounting amid competition with Indian rival MakeMyTrip appears to have eroded its value and ability to raise more capital. Raina said that under Ebix, Yatra would cut down most of the subsidies for its hotel business and turn profitable in a matter of months. Around 40% of Yatra's annual revenue came from corporate travel in 2018, which ties in with Ebix’s focus on the segment since its acquisition of Via.com last year. “It is not a random buy. As Yatra has a strong portfolio of corporate travel, it seems like a fantastic buy," said a venture capital investor with strong ties to Yatra who requested anonymity. Ebix said it aims to close the deal by May 15. However, Raina is not just looking at Yatra's corporate portfolio. He said that Ebix will take the B2B route to conquer the business-to-consumer (B2C) segment in India as well. “We have a strong physical presence in India across several smaller cities and towns, where people still don't buy travel online,” he said.